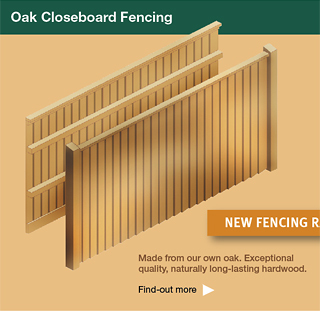 Orlestone's close boarded fencing is constructed using timber posts with a gravel board fixed between at ground level. Arris rails are fitted between the posts (the number will depend on the height of the fence) and feather-edged panels are fixed in a vertical position to the arris rails. The feather-edged boards are then finished at the top with a capping rail. For posts to be visible from the front of the fence, posts can be supplied already morticed, ready to accept the tennoned arris rails. The featheredge board is then fixed flush between the posts. For continuous fencing, cleats will be needed so that the arris rails can be fixed proud of the posts. The feather edge boards can then be fitted in a continuous overlapping manner. 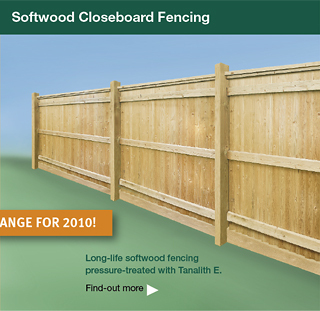 Because closeboard fencing is not supplied in panels, both the the visible post and continuous design are ideally suited to sloping ground.